Staff Sgt. David Hatters supposedly stationed in Kabul, Afghanistan. Claims that he has a 12yr adopted son named mike hatters who is supposedly sick and in Canada with a Canadian diplomat. His son's email address is [email protected]. Wants to deploy home early. Son is very sick and needs an operation. However has no money for his flight because the army will not pay for it since this is an early release from the military. Will ask you to contact Sgt. Amos Amanfo Asante and give this email for him [email protected] for flight prices and needs the money sent trough money gram or western union. A conglomerate of diverse companies operating in Oil and Gas, Power and other energy sectors of the economy. this a few people in this scam together david hatters which you cant find nothing on at all. his not military these are a highly educated and well organized group that takes advantage of any one. they even use a model of a kid to pretend its the made up mike whoso calls have heart problems and needs surgery right away and they need at least 25k to 35k to be sent to this fake sgt. amos who real name is felix adjei lamptey. 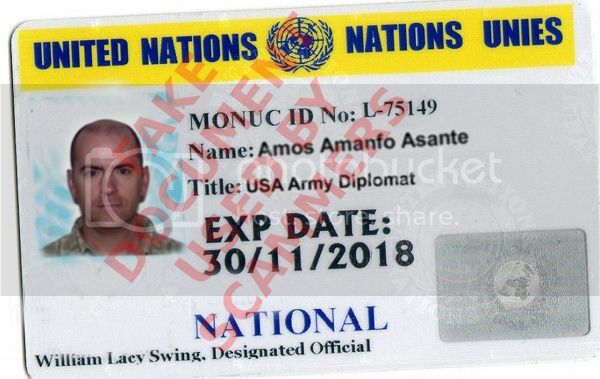 the id is fake from sgt.amos. i dont know how they got pictures of this man but they have sent several pictures of this same man in the dating app he is on. they have a good way to make you doubt yourself. david is suppose to be i afghanistan for 5years now with gangrene and kidney failure. Haha the kidney failure and gangrene lasted for a year in half really?? ?Dont believe a word he cant provide you with an apo adress and all the money and anything you send must be sent thru sgt.amos. the other names involed in this scam is kgomosto josephine mahanlghu from south africa. You cant verify anything that they tell you. i went to an army recruiting office and took the fake les which is like a pay stub for military personnel. they said it was a total fake and he add a a fake ssn that didnt match his dob or the so called state he was born in Rhode Island. They did their research people!!!! They even gave me the high school he was supposed to graduate from Cranston high school east in rhode island not a signal picture of this man!!! Well they sent me 23k to my bank and the bank flagged it for money laudering and held the funds but the man name tom over the account never sent them back the money he stole it and they never got it!!! they think i stole it haha!! !Then they sent me 1975.00 to my account and i was supposed to sent them 5k but i never did and they were expecting me to sent them 21k the next day really??? i kept the 2k and logged off line and skype and other online apps.!!! hahaha Good riddens to all of them they got a taste of their own medicine!!!LOL!!!! And the so called sgt.david hatters got mad at me and told me if i dont show him my account to prove i have the money he will never ever be with me again i mean it now!!!! BYE!!!! i said goodbye!!! it hurt me a lot be i will be ok cause i have Jesus in my life and on my sideThank you Jesus!!!!! Praise God!!!!! Im glad they are gone they were woresome!!! They got on my nerves!!! If you read this i hope you get some joy out of this a knew God is always watching over you. Cause literary. the lost 23k and 2k after all said and done!!! God is Good!!! may God bless you! if you can verify it drop it!!!! You seem proud of the fact that you stole the money. That makes you no better than the scammers you are complaining about. Especially since the money that you stole will have come from another victim. Hopefully that victim will report the crime and pass your bank details to the authorities. It seems that you have symthaphy for people who live to.prey on others and take their money and destroy their lives emotionally and financially. I'm not proud of taking their money but I dont feel sorry for them either. People like that dont have a heart or soul to continue to destroy lives day after day. What they did to me devastated me emotionally and if I was materialistic or if I didnt have the faith that I had in God to overcome the pain I would have killed myself. I lost a lot of money and I have to rebuild my life all over again. So no I dont feel sorry for them if the bank stole their money and I didnt give them their dirty money back. You must be just like them to have feelings for people that goes around destroying lives for a living. Since you feeling so sympathetic you go fond them and give them your money. No, I have sympathy for the innocent victim, whose money you stole. That makes you no better than the scammers you were trying to punish. ETA I've now tagged you appropriately and as this site is all about warning victims of scammers, I'll add your email address as an admitted fraudster [email protected].